A castaway from El Salvador who claims he spent more than a year adrift in the Pacific has begun his journey home. 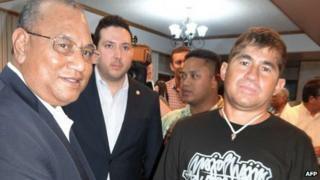 Jose Salvador Alvarenga thanked the president of the Marshall Islands, where he was found late last month, before boarding a flight to Hawaii. He says he left Mexico for a trip in a fibre-glass boat in December 2012 with a friend who died on board. For fluids, he claimed to have drunk urine, rainwater and the blood of birds. He was rescued on 30 January by people living on the island of Ebon Atoll. "Thank you for everything the people of the Marshall Islands have done for me during my stay," Mr Alvarenga, 37, said through an interpreter before leaving for Hawaii. He will make his way from there to El Salvador to be reunited with his relatives. President Christopher Loeak presented him with a woven garland, the AFP news agency reports. The fisherman had been due to leave last Friday, but doctors said he needed more rest. The family of his younger friend say they want to speak to Mr Alvarenga to find out more about how their son died, and what happened to his body. Known as Ezequiel, he is believed to have starved after being unable to eat raw birds and fish.